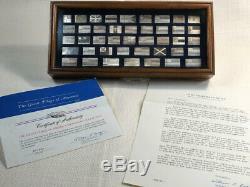 Franklin Mint THE GREAT FLAGS of AMERICA set is 42 Sterling Silver ingots, cast with the design of flags throughout US history. Includes the book describing the history of the flags (some loose pages), the original letter from the Franklin Mint, the Certificate of Authenticity, and cleaning instructions with originally supplied gloves. 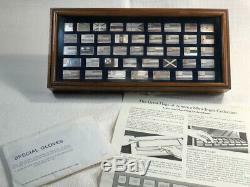 The display box and glass are in very good condition (no damage). Note: Flags have not been handled and have a very small amount of tarnish. 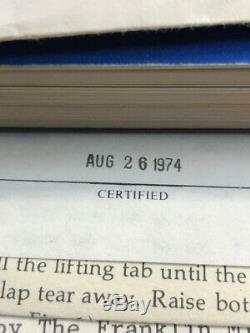 They should clean to the original condition with the instructions included from the Mint. One was inspected and the back was still highly polished / untarnished. They have been in the case covered with a foam layer provided by the Franklin Mint. 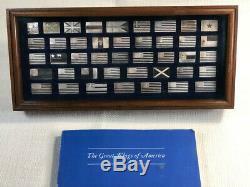 The item "Franklin Mint THE GREAT FLAGS of AMERICA Sterling Silver Collectable Set" is in sale since Sunday, February 17, 2019. This item is in the category "Collectibles\Decorative Collectibles\Decorative Collectible Brands\Franklin Mint\Other Franklin Mint". The seller is "twilsoneb" and is located in Rochester, New York. This item can be shipped to United States.